Well this little monster is as happy as can be. He's in a great mood 90% of the time, even with a cold. This week he started to roll off of the couch, so that he could hang upside down. He climbs all over us like we're a jungle gym, so that he can roll off of us, pillows, the couch, etc. He likes doing back bends. 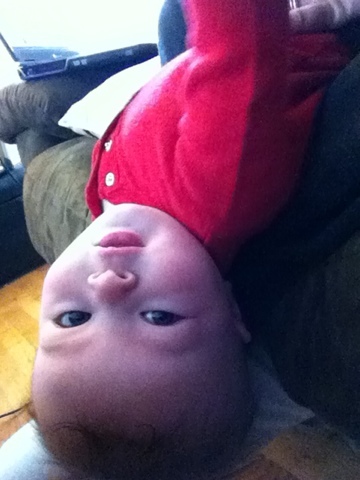 We of course taught him to go upside down, by dangling him and playing with him. He just loves it. Seeing everything upside down must be very exciting when you're just learning about the world, right? So I let him do it until his face starts turning red, and then I distract him while I hold him upright. 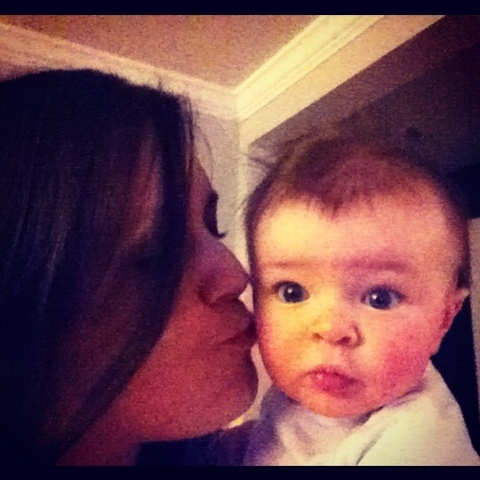 Crazy little monkey. He's been sleeping better at night, which has been great. Keeping him in his rock and play, at a slight angle, is great for his cough. The cool mist humidifier also helps, and he loves to stare at it. It's a big green frog. He talks to the frog sometimes in the morning, it's adorable! He hates having his nose suctioned, he hates having it wiped, and he definitely hates saline drops. I can't blame him for any of these things. I would feel exactly the same way. He loves his baths. Now he will reach for the sink if he's in the kitchen and sees the water coming out of the faucet. He's always wanting to dive into the water. Max and Dixie are becoming friendly! Last week he started to watch her as she walked by, or moved around on the bed during story time. Now he looks for her when he hears her bell, and closely watches her move around the room. He's captivated by her. 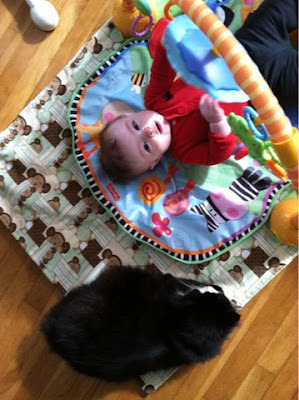 She sat with him on his play mat Friday, and watched him play for a while (until he was too noisy for her). It was awesome to watch. This week we've had something new happen. Max HATES being in the dark in the car. When I pick him up from daycare, he wants the interior light on. For the whole ride. Poor little guy, he's curious and wants to see stuff. I have to figure out a way to get him some light back there, because the light we have in his mirror just isn't sufficient. His favorite song is the alphabet. It has been his favorite for a few weeks. I've tried a few other songs, and he doesn't react the same way. He doesn't like the whole song though, just the letters part. Once you get to, "Now I know my ABC's" he gets mad and cries at you. You have to go from Z back to A, immediately. It's pretty cute. I love that he knows the difference. I'm a little baby, short and stout. Here is my diaper, here is my mouth. Tip me over and feed my mouth! He loves the end, I always tip him a little when I say it. He gets a big smile and kicks his legs. Happy boy.